Its her fault…Thats my story and I am sticking to it. Where did these strange looking pigs come from? I look out on the fields of our farm and I see these rather odd pigs quietly grazing and sleeping. And everywhere I look it seems like I see them.This is way more pigs than any plan I had originally for our little farm. Its my wifes fault. My wife found them first. You see about 6 years ago (2013)she shows me this webpage on Chinese Meishan pigs. Now understand we had pigs at the time (too many to her thinking/liking). I was in the middle of building an American Guinea Hog herd that I had traveled to 7 different states to assemble. It was a nice little hog but my wife was concerned about their impact on our land. Because regardless of what some might say they do root(though much less than traditional commercial breeds). We had tried Gloucester Old Spots. But after the piglets we brought in confirmed beyond a shadow of doubt that there was no secret deposits of oil on the property(as deep as they dug we would have hit a gusher by now) they moved quickly to the freezer. We dabbled with some Kune Kune. And we found whatever their differences to AGH a personality devoid of rooting wasnt one of them. So here comes my wife with this info on a wrinkly faced hyper productive pig from China. So I began to investigate. For about 8 months it was the usual web pages and Facebook groups.And the more I looked the more intrigued I was. The Facebook groups would have scared most folks off however.At the time there was a running feud between two or three breeders.And I dont mean your usual FB spat this was more like a lifetime movie script with pages and the “truth about” pages.It got pretty ugly. 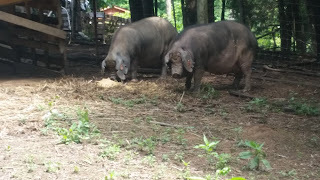 But the more I read about the pig the more I saw the same things I liked about my AGH but with larger size,faster growth, larger litters and if you were to believe the write ups even a more docile nature. So I contacted the two most polarized breeders to discuss the breed.I talked to the Hatfields and then I talked to the McCoys. And another year passed while my own AGH herd was growing and people seemed to support our concepts of breeding for traits to benefit a small holder (stronger hams and shoulder and faster growth rates).A customer would come from here and a customer would come from there and the next thing I knew we had our pigs in herds in twelve different states. But still we had hit what I call the “glass ceiling” that plagues AGH and KK. That is the limitations of the pig ( small size,very slow growth ,smaller litters, and a limited meat outlet) meant it had risen about as far as it could on my farm. It could pay for its feed and a little more but it had no real end game as a meat animal for individual customers or restaurants. So in December of 2015 I acquired a boar and two unrelated sister gilts from the breeder that I had the highest confidence in at the time and we were off. We fell in love with the pigs.Original plans to cross them with the AGH were scrapped as this was just a better pig for us .It had a lower pasture environmental impact , it was quiet bordering on silent and everything written about how docile it was absolutely true . This was a GREAT pig. And even my wife loved them. But I needed at least another boar and another gilt would be great.Our farm model was always about enough genetic diversity to sell breeding pairs.So the search began in earnest.I found another breeder but honestly nobody seemed to know or was willing to tell where their stock came from. 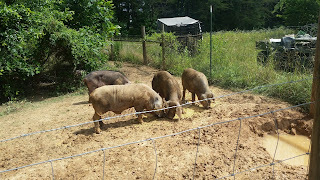 I had learned from my AGH that you could end up with liter mates even if you got pigs from two wildly separated states. So I sent the e-mails out. I sent e-mails to USDA Scientists . Then I sent e-mails to Iowa State. Finally I sent e-mails to Illinois. Basically if you were remotely associated with the original study you got an e-mail from me. The responses ? 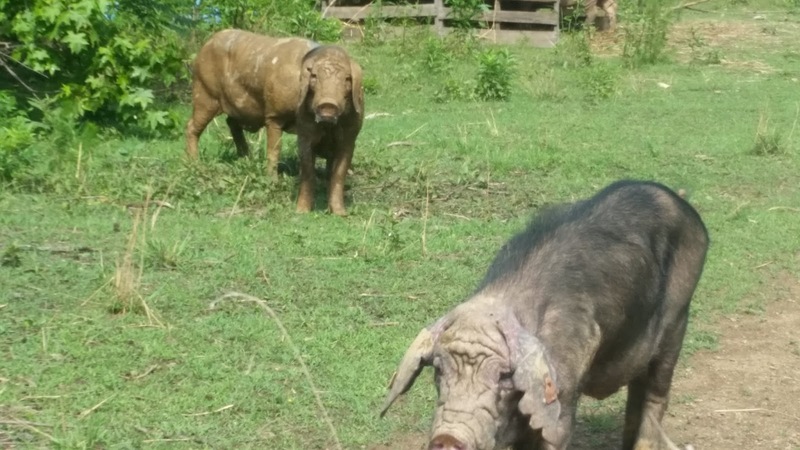 It was the sounds of crickets,nothing,nada,zilch.
. Then one day just after Christmas someone on the Facebook group Meishan Pigs asked where they could find some Meishans. 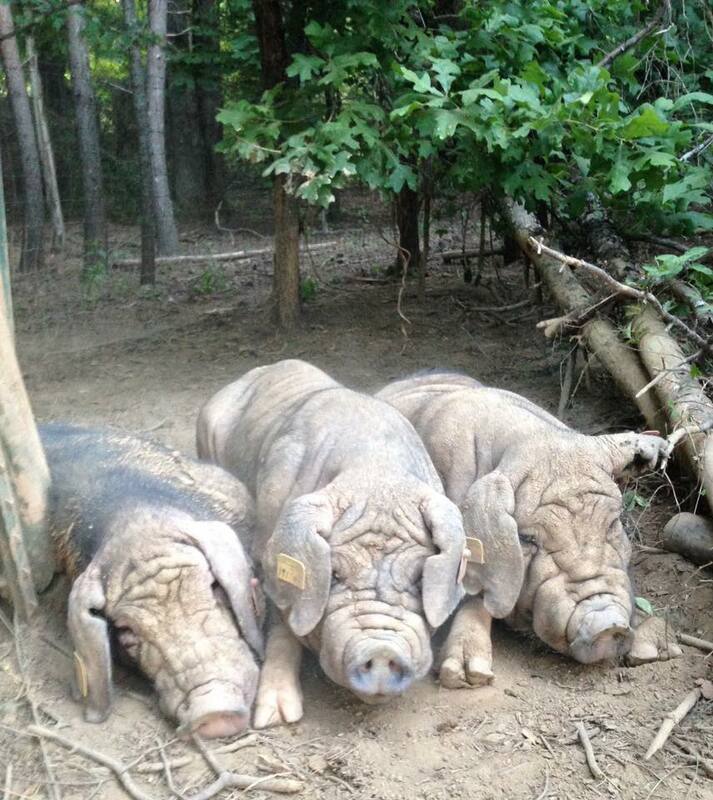 Someone commented back that “Ohio State had some Meishan Pigs for sale“. A discussion broke out the fact that was not possible.I stayed out of the discussion.What I did do was fire off an e-mail to the Department of Animal Sciences at Ohio State. That was December 29th 2015.On New Years Eve one of the researchers there actually answered me. 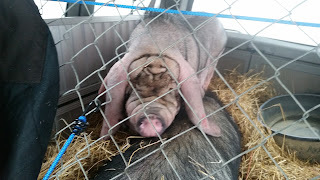 He said they didnt have nor ever had any pure or cross Meishan Pigs .But that he would “ask around” for me.We exchanged several more e-mails(he was in Ireland at the time). And the next thing I knew I was talking to the head of the Department of Animal Sciences at the University of Illinois. They only had a pair of 2 year old females left from the original research stock and had decided it was time to let them go.In February 2016 I drove from Niota TN to Champagne Illinois and loaded them in the back of a 2003 Chevy Astro van .Yes the two 350lb+ girls made the trip to our farm sprawled out in the back of a mini van.Soccer Moms have nothing on me .The picture above is them riding to TN. But I still needed a boar. And so I called him. I dont think that scientists (he was a swine reproductive geneticist) are used to getting out of the blue phone calls from no name small farmers from TN very often. Thats the impression I got at least.To my shock he told me that the decision had been made to designate the remaining Meishan Pigs as “excess” and that yes there may be a way to get them I asked how many what sexes? But he did not know.He only said he would check with he facility director. Four days later (the minimum time in my estimation to be persistent without being annoying) I called him back.He said that he had now heard all the sows had been “designated for slaughter”.My knees actually buckled a bit when I heard this.When he said that I asked if I might call the facility director he said that was fine with him. So I called the facility director. During that conversation I learned five boars remained but the last sows were going to be slaughtered for a specific cell to be harvested. 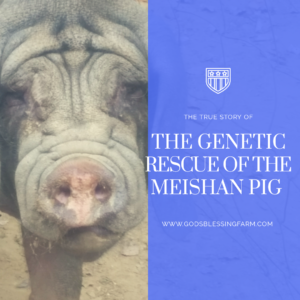 A final experiment after 26 years of experiments on the Meishan Pig breed. We worked out the details on the boars and in a followup e-mail I made a case for ,if at all possible ,could I get a sow or two. I had spoken with him how small land holders had an excellent record as genetic reservoirs. And that it was only through the efforts of small land holders that swine breeds like American Guinea Hog,Mulefoot,Large Black and Red Wattle, to name only a few, even existed today. It must have worked.Soon I was contacted by the swine manager at USMARC and I was told that five boars and two sows were available if I wanted them. I know that decision must have come from the heart as much as the head..Even in a research facility the Meishan Pig had made friends. When I told my wife I was buying five boars sight unseen (It violates USDA policy to distribute pictures of stock in the USMARC Facility) she looked at me like I was a madman. That meant we would have six Meishan boars and six Meishan sows on the property along with our AGH pigs. But when we talked about it we realized we might be buying the last five passenger pigeons. What we didnt take would be quite literally lost. When the swine manager at USMARC sent me the breeding records and it was apparent that these were five genetically distinct boars . And there were two unrelated and genetically distinct sows. It was the all in or all out bet at the poker table.And we decided to go all in. All in means all five boars stay. And by mean all in I mean all in. 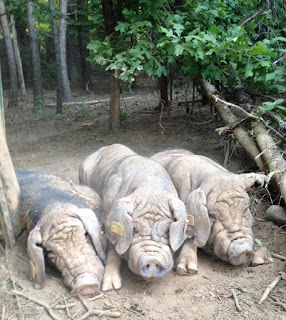 We could not just buy these seven hogs. We would commit to keep them and the other Meishan Pig genetics we had collected. Because it wouldnt have been any problem to have sold off any or all of these pigs. 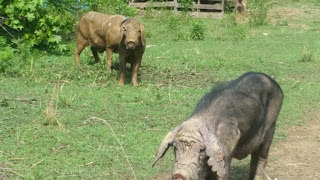 They are quite literally the rarest Meishan Pigs outside of China. But then once again the breeds genetics would be scattered. And scattered into a community that didnt have the best track record of cooperation. The genetic death spiral of the Meishan Pig might be delayed. But it couldn’t be forestalled. No if we kept all of these pigs it would have to take a commitment. A commitment to maintain the most genetically diverse herd outside of China. A herd that could be used to supply fresh genetics to every current and future Meishan Pig owner. With that decision came other realizations. Our other pigs could not stay. We could not serve two breeds. After a year on the American Guinea Hog Association Board of Directors I knew the breed was well on its way to recovery. So my breeding efforts of the last six years were now over. The herd I had obtained from seven different states had to be dispersed. It was a hard decision.I was beginning to see the fruits of our efforts. The qualities we culled so aggressively for were beginning to shine through. 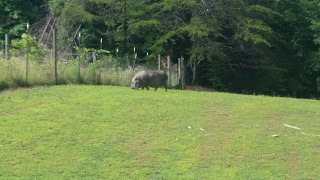 But the Meishan Pig is an amazing hog.It wasnt just a cause it was a better hog for us. It is probably the most studied swine breed ever in the US. But is it a stand alone homestead livestock breed? Is it an excellent breed to cross into other breeds to replicate its many positive qualities? 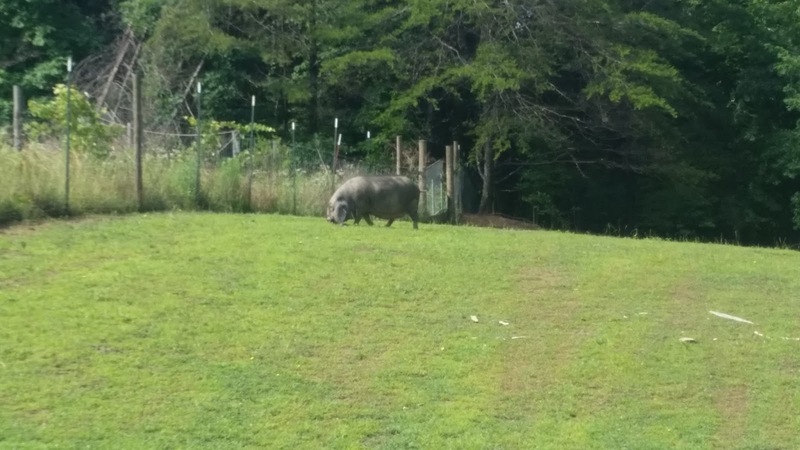 Is it a pasture ornament,or an exotic a pet breed? I think it has a role in all of those niches. But most of I all I believe it has to find a role in the craft pork movement. Either as a stand alone or a cross. Because that gives it sustainable value to those who choose to breed it. Though I doubt they will ever read this. I want to thank the people who were instrumental in this journey. People who have helped and are helping us peel back the “onion” that is the Meishan story. People who put up with that annoyingly persistent small farmer from Tennessee. Jeffrey Valet Geneticist USDA US Meat Animal Research Center Clay Center NE. Harvey Blackburn Senior Animal Geneticist USDA Genetic Resource Preservation Sevice Fort Collins CO.